Woolly apple aphid (Eriosoma lanigerum, WAA) is native to eastern North America but now occurs on apple throughout the world. Young WAA nymphs have purple bodies covered with powdery gray wax. 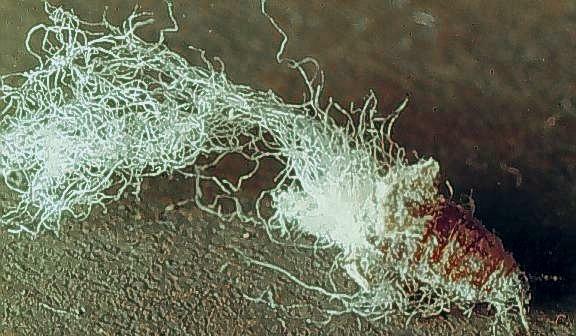 Larger nymphs and adults have long white wax filaments emanating from their bodies' posterior. 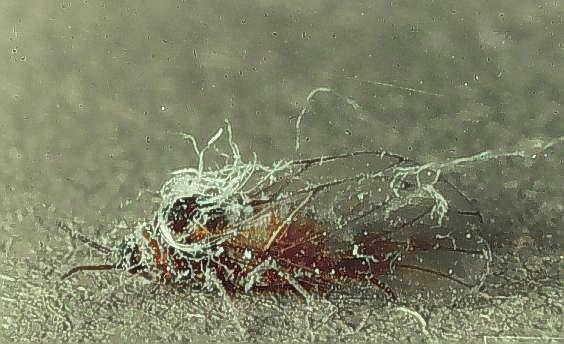 Not including the filaments, the insect itself is approximately 1/16 inch (1.8mm) long. 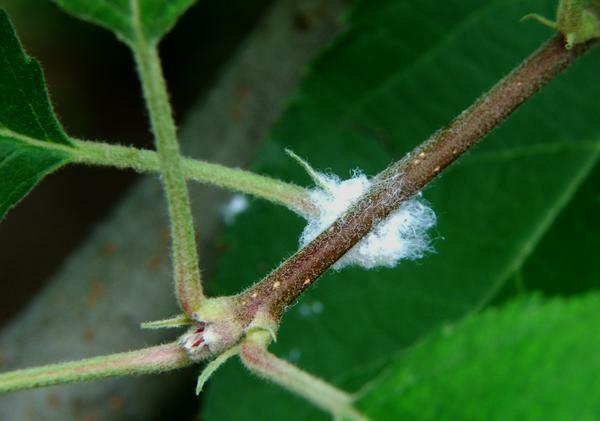 They are almost always found in colonies, which appear as white patchy tufts on stems, twigs, and bark. Adults and nymphs both have needle-like mouthparts. Eggs are elliptical, 1/50 inch (0.5mm) long, and embedded in a waxy secretion (though they are seldom seen). 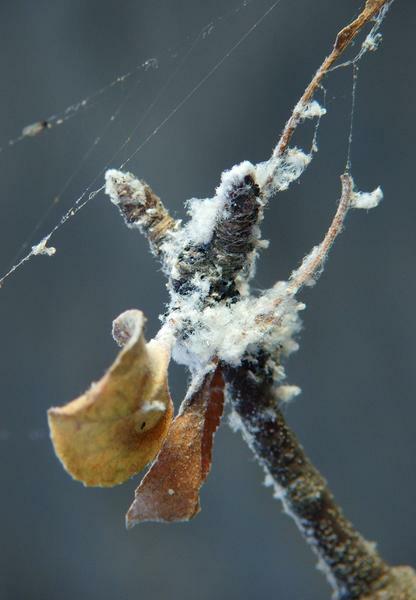 When elms are nearby, WAA will overwinter on cracks and bark crevices either as eggs or as immature nymphs; if there are no elms, they remain on apple year-round. In the spring, eggs hatch as wingless "stem mothers" that then give birth to wingless nymphs. 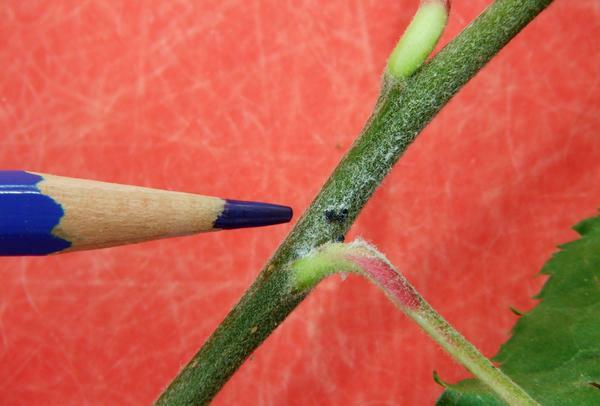 Aphids feed on buds and young leaves, causing heavily infested leaves to curl into a rosette. By spring or early summer, a generation of winged aphids called "alates" are produced. These migrate to apple (or other hosts, such as pear, hawthorn, and mountain ash) and produce repeat wingless generations that feed on the host throughout the summer. 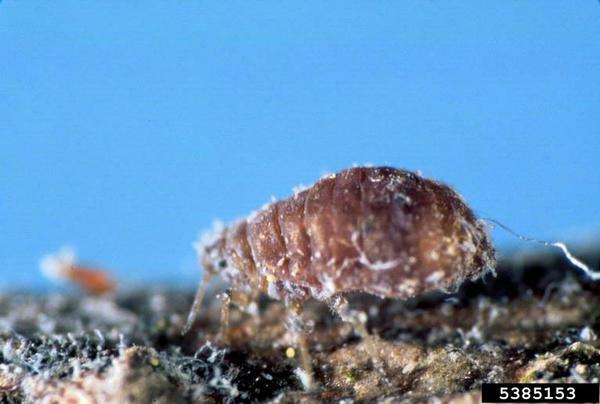 When populations are high, nymphs may migrate to the bases of trees and attack roots through cracks, loose soil, organic matter, or root suckers, sometimes establishing continuous underground colonies. Whether above or below ground, colonies will produce winged females in the fall. These migrate back to elm trees (if available) where they give birth to wingless males and wingless females. After mating, a female will insert a single egg in a rough area in the bark. Though much dispersal occurs during the winged stages, WAA also can spread as nymphs dispersed by wind, birds, and other insects. First instar nymphs are much more active than later instars. Foliar colonies are not a good indicator of root infestations, as a tree may have foliar infestations and never develop root infestations. Above ground, WAA feeds on new growth around pruning cuts and on leaf axils on sprouts. The bark cannot heal properly in areas where WAA are feeding around wounds. Gall-like swelling may appear where WAA feed on new growth around small branches. In general, however, above ground infestations are not particularly harmful, especially on older, mature trees. 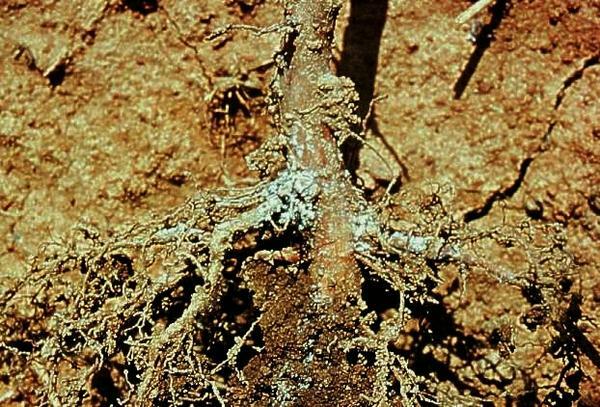 Root and below-ground feeding can be much more damaging, with heavily infested trees developing a shallow fibrous root system and yellow foliage. Damaged young trees are easily uprooted. Since there are usually alternate hosts outside of orchards, WAA can be difficult to manage. Some of the carbamate and pyrethroid insecticides may increase problems by killing naturally occurring parasites. If a large number of foliar colonies are detected, a good aphicide usually provides control. (Due to the high variability of populations and the difficulty of quantifying damage, no threshold has been developed.) There is no insecticidal control for underground colonies, but some of the Malling-Merton series of rootstocks are WAA-resistant. 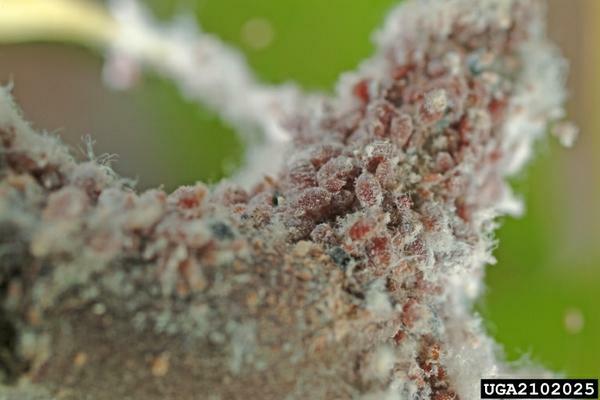 Obviously, nursery stock with existing infestations should never be introduced to an orchard. 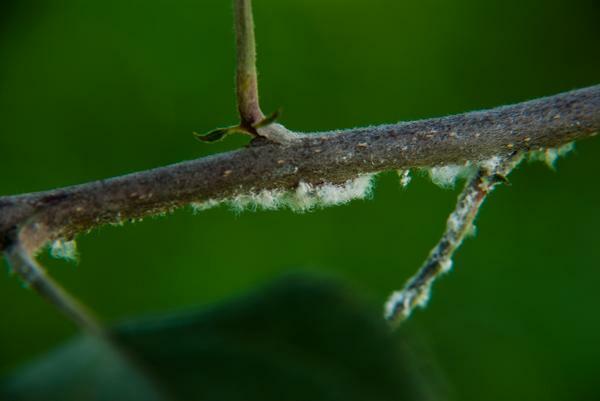 Parasitized woolly apple aphid colony.